What I've Been Reading: Holiday Reads | emma etc. I'm shocked that the last book I read was in the May/June period, as seen in my last What I've Been Reading post. Today I thought I'd do another one of these posts with my brief thoughts on two books I finished over the 10 days I was away. I have a few posts coming up eventually which will involve my holiday, but for now I thought I would tap out a few sentences to do with these books and why I enjoyed them (I did!). 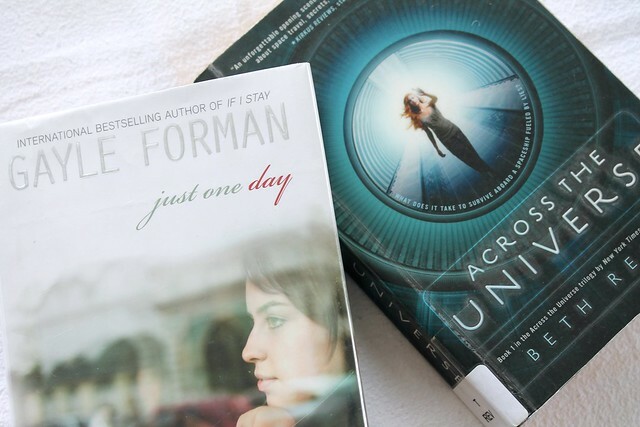 These books are very different, one more a dystopian style book called Across the Universe which is set in space and the other which is set in a 'realistic' setting which is more of a love story/romance called Just One Day. The first, Across the Universe by Beth Revis, kept me alert and reading pretty much the whole time. It's one of those books where you just want to know what happens more and more as it goes on, and there are a few plot twists or unexpected valleys the book goes down. I personally love reading fantasy/science fiction books quite a lot of the time, although I do love something different other times. Even if you aren't a lover of science fiction books and never thought you'd read one, I suggest giving this a go as it's an easy read, where the author keeps you wanting to read it. It's set in space aboard a spaceship, but it's not as boring as it may sound. It's also in the alternating perspectives of Amy, a girl who is a frozen passenger aboard the ship, and then in the perspective of a boy called 'Elder' who is the future leader of the ship. This series is a trilogy, and I will definitely be reading the next book, A Million Suns at some stage. The other book, Just One Day by Gayle Forman, (you might know the book/film adaption If I Stay which is by this author) is about a girl called Allyson. In Europe, she meets a guy called Willem who pretty much ruins (I'm not sure that's the right word - but at least makes her feel pretty miserable) the whole next year of her life for one reason or another. You'll have to read it to find out as I don't want to spoil it. I loved this book because it was set in Europe, the place I want to travel to most. I found it really quick to read, and even though it kind of dips in the middle, it comes right back up near the end. This book is all about Allyson's self-discovery and I felt it showed that not everything is about finding that other person, but finding yourself. Sounds pretty cheesy but it's a good book. This one also has another after it called Just One Year, which is apparently in Willem's perspective. I'm reading another at the moment and I should get around to finishing that within the next week or so hopefully (school is starting tomorrow so I don't really have that much free time to read). I have missed reading so much and reading these two books has made me really want to get back into it. I accidentally ordered way too many books from the library to read because my list has been building up over time. But if you have any books you think I must read, put them in the comments!